An electric car sharing program that's launched in Indianapolis faces lingering questions about its city subsidies and complaints about the charging stations tying up parking spaces. Mayor Greg Ballard has promoted the BlueIndy program as an energy-saving alternative mode of transportation, while some skeptics wonder whether the city is the right choice for such a service. 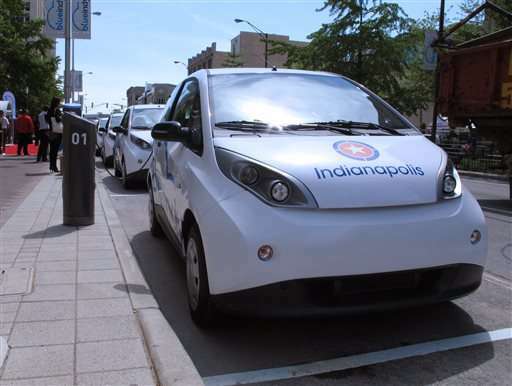 The city's BlueIndy partnership with French company Bollore Group began renting the cars to the public on Wednesday. Drivers who buy a membership can rent the cars by the hour and return them to any of 26 self-service charging stations in the city. Ballard said the city is offering an on-demand car that he believes will appeal to many people. "It's there when you want it and when you need it," he said. "It's a service that is perfect for students who can't or don't want to own a car, for empty nesters looking to downsize, for people who need reliable transportation that can't afford car payments and insurance and registration and fuel." Bollore says the company is investing $41 million in the project that will eventually have 500 cars and 200 charging stations. The city is spending $6 million on the project and Indianapolis Power and Light Co. is contributing $3 million. Some Democratic City-County Council members question the Republican mayor's decision to spend so much on the car-sharing project rather than public safety and street repairs. They also say Bollore is getting other perks, including not having to pay city fees for permits and the use of hundreds of parking spaces at no charge. "We got brand new BlueIndy cars and we can't find adequate police cars for public safety, which is number one right now with the murder rate," Councilwoman LaKeisa Jackson said. Chas Navarra said he was alarmed when a charging station for several BlueIndy cars went up along the street close to his home in the Old Northside neighborhood near the city's downtown. "I live in a historic neighborhood, and I've got a rental car business in front of my house," Navarra told The Indianapolis Star. "What's the difference between having this and Hertz or Avis parked out there? How is this going to be good for my (property) valuation?" BlueIndy President Herve Muller said few of the stations are in front of single-family homes and that locations were picked based on residential densities, where people work, college locations and busy transit routes. Michael Thwaite, president of Plug In America and a partner of Tesla Motors Club, said he was surprised Bollore, which owns car-share operations in Paris and London, picked Indianapolis for its first such venture in the United States. "It is an odd choice, there's no doubt about it," Thwaite told the Indianapolis Business Journal. "One would have thought that they would have started in a very electric-car-friendly city." BlueIndy says it has sold more than 1,000 memberships already and expects tens of thousands of users during its first year in Indianapolis. "We think it's the perfect city to do this," BlueIndy General Manager Scott Prince said. "If we had the world's greatest mass transit system today, this arguably would not be the first city we'd be launching in in America."